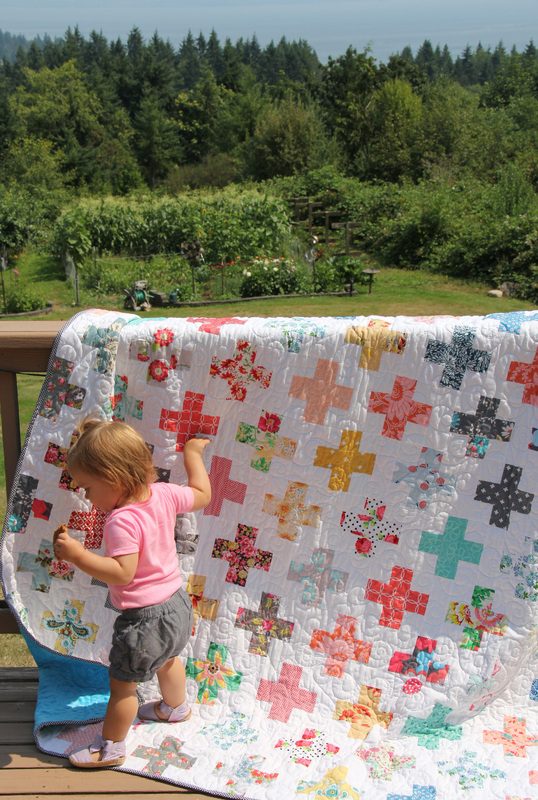 Since this quilt lives at Grandma’s house…Jane and I took photos in her beautiful garden on the most beautiful day! My Mom made this with strips cut from her floral fabrics, and used the pattern Simple Addition to put them all together. I blogged about this quilt top back here (click here). Kathy quilted this in a beautiful loopy pattern with a bright blue, soft minky on the back. 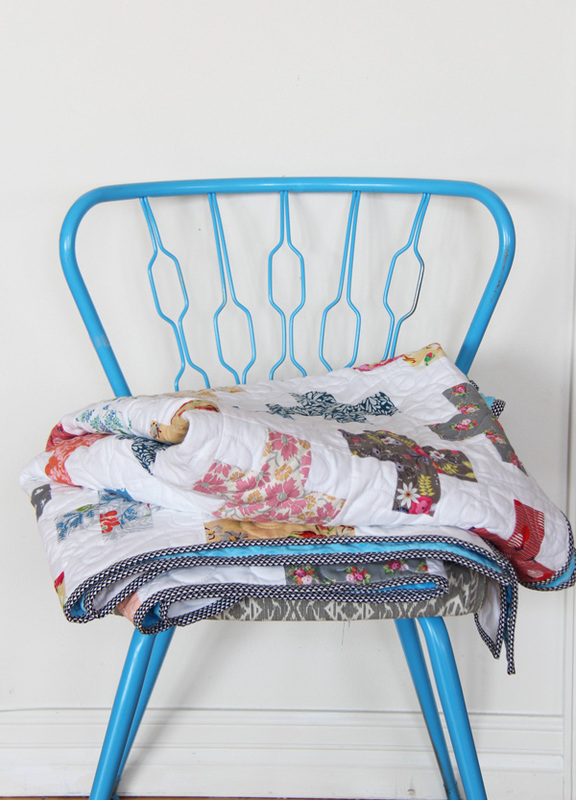 This quilt lives in the living room, so a soft backing is a must! Look at that soft crinkly goodness!! Everything takes 400 times longer with a one year old around. You can tell she’s at Grandma’s house…she’s got a cookie in one hand! 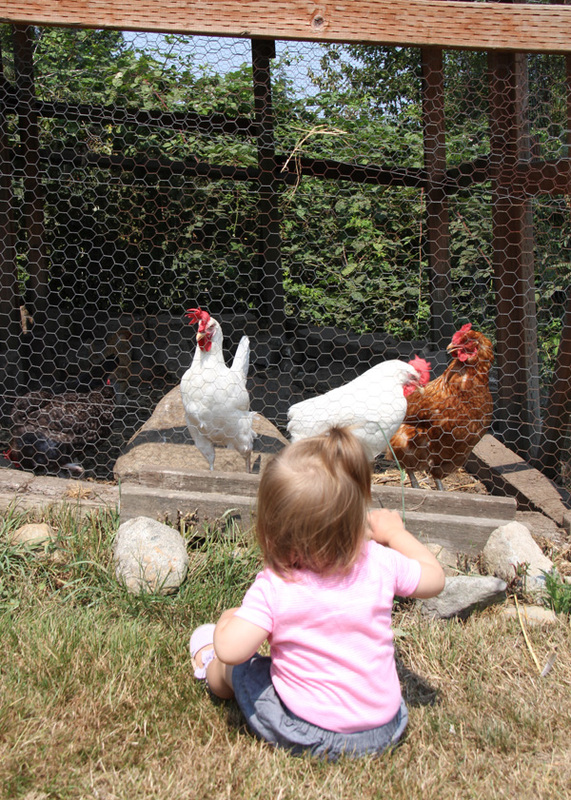 Jane’s not so sure about the chickens. She learned the hard way they like to peck little fingers. 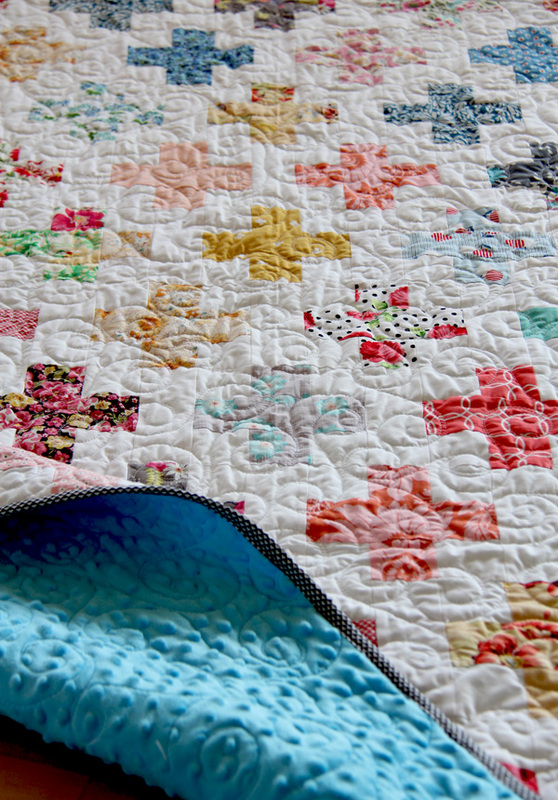 Ten years later and I still really love blogging and quilting…who would have thought?! Thank you for reading this blog, supporting me, cheering me on, and being my friends for the past ten years! Congratulations on the past 10 years! It is great to see where you start and when you go. That was why I started to blog, just wanted to see what I was doing and where I was going. Meeting some great people along the way is the added bonus. So true! The key is to blog for yourself…and the rest is just a fun perk! Thank you for visiting! 10 years? Wow, reading your blog has been great fun. I hope you keep writing it. I read your first blog post…You were the one who really made me feel like I could do it! I do now I quilt a lot…or as much as I can. Congratulations cannot wait to see where you go from here! Congrats on 10 years! So glad you stayed around the quilting world! You do such beautiful work! I always enjoy seeing your projects and reading your blog. Congratulations on 10 years! Jane is darling, love the photos! Wow – that is awesome! I had a blog 10 years ago…ahem…did not keep it up!! :). Love reading along and love love love your quilts. LOL! It is a lot of work as you know…and sometimes hard to keep up! :) Thank you! Love your style. 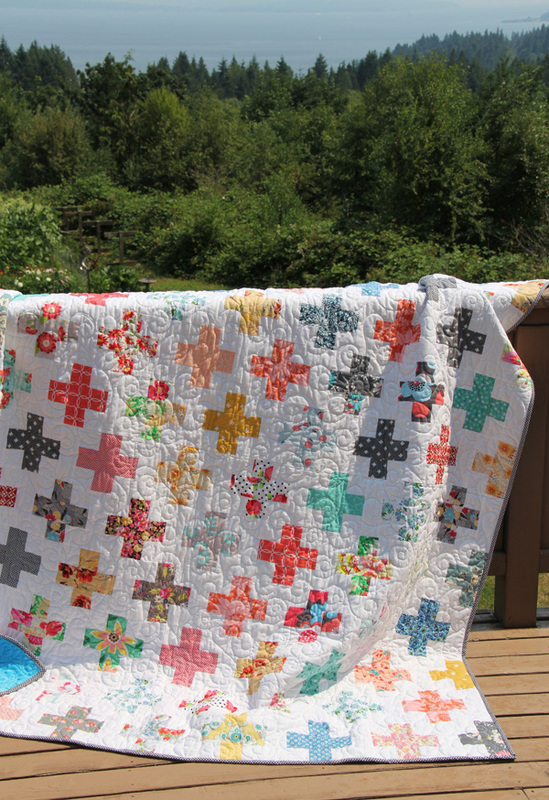 Very cheerful and pretty quilts. Congratulations on ten years! Your quilts are always beautiful. 10yrs! Congratulations I love your posts and designs. I have your growing up modern book which I love. I have quilted several of your designs made by some of my customers. 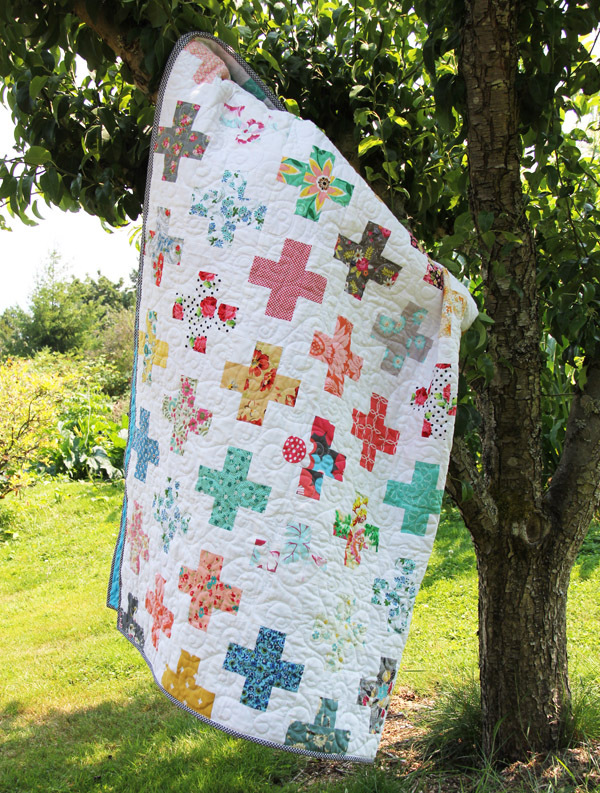 The plus quilt is fabulous, good scrap buster quilt. Cute granddaughter! Congratulations on 10 years. I love reading your blog, and I love (and own) many of your patterns. Your voice is always so clear in you writing. I’m sure I have been reading your blog since the early days . I have always loved your style. The more I see the plus quilt pattern the more I want to do one. Now I will have to consider the florals or maybe do two. Thanks for sharing. THANK YOUS! are in order. All the inspiration and fun are much appreciated and the connection to Ashton! Where does your mom live? Ask her if she remembers the Evans’ that were friend with Darla, etc.! Thank you! My parents live here outside of Seattle by us…but I will ask her! Yeah 10 years. I enjoy your blog and your quilty creations. I do hope that you still enjoy blogging for some time to come. I appreciate your design sense and the ever present sense of happiness in your quilts. I quilt and I quilt and sometimes I loose my way in my design journey. I visit your blog and it almost always helps me find my way back to my center and the joy of quilting. Thanks! Congratulations!! 10 years that is so exciting!!! I love and enjoy reading your block . You are so inspiring and generous for sharing your wonderful talent. Thank you 😊!! Congratulations on 10 years. I always enjoy reading your blog. Your work is beautiful. Well done Alison – a fabulous achievement. Thank you for so much inspiration and sharing your love of quilting and life as a mum. You’re a fun read! Keep up the lovely work. Congrats! Your blog was the first one I started following when I finally got up the nerve to try quilting. It is still my favorite! Thanks for all the great posts, tips, tutorials and all that you share. May the next ten years be as great as the first. Thank you! And I’m glad you got up the nerve to try it! Félicitations pour votre blog et Joyeux Anniversaire !!! Congrats on your 10 year blogiversary! Your first blog post was about as wordy as mine :). It’s scary to take that first step. Your pictures of your quilt and Jane are adorable and that scenery is spectacular! I would LOVE to get the pattern for that ” rolling Stone” block with the plus in the center, but I don’t see it as a pattern anywhere? Thank you! That pattern is called “Spin Cycle” under my patterns/shop! Congratulations on 10 years. You do beautiful work and I enjoy looking at all you make. Congrats on 10 years! Your plus sign quilt is adorable. I always love reading your blog. Congratulations on your milestone. I love the plus quilt, it looks so pretty and fresh. Thanks for sharing and making us smile. Happy 10th Blogiversary, Alison! Thank you for not only sharing your love of quilts, but also your precious children. Best wishes for the future! Congratulations! I always enjoy your blog, and i am always in awe of how you can find time to see while raising a family. Your mother’s view is awesome! Does she live on one of the islands around the sound? I especially liked your Seahawks colors on your football quilt : ) . I’m glad you found my blog then and welcome!! You should see Jane’s hair first thing in the morning! It’s wild and it matches her fun personality!!! :) Thanks for always visiting and leaving me sweet comments Helen! Thank you and Congratulations! Cluck Cluck Sew is my favourite go-to blog. Thank you for your fabulous quilts, hints and advice! I started following you when you just had the two boys!! 8-) I’ve really enjoyed it, too. Yours is the first blog I ever read! Congratulations! I love love love the floral plus quilt! Thanks for giving the rest of us hope with the link to your first post :-) and congratulations on 10 years – boy have you come a long way! Congrats and love your stuff! Have your book and most patterns, but LOVE the floral idea for the plus quilt!!! Congrats on 10 years! Your blog has always brought joy to me…inspiration, cute kids, beautiful quilts and ideas, donkeys and cream sticks. Best to you always!!! Thank you Linda! Can’t believe it’s been 7 years since we lived there in Ohio!!! Congratulations on 10 years! I love your blog, please keep up the great work! I love your Blog, Patterns/book, and fabric! Thank for being full of quilty inspiration!!!! LOL I know can you believe it? Now I’m glad they weren’t loving all the crafty stuff LOL. LOVE your 1st blog! Congratulations on keeping it going for 10 years, thank you! I love your blog, been reading 5 – 6 years and still get inspired by your creativity. Congrats! Here’s to at least ten more! It’s been my pleasure to stop by and see what’s up here! Not only the quilts but the babies, bunnies, cat etc. I love it all…be blessed. Thank you Melanie…what a sweet comment! Thank you for visiting and following along with me! I love your blog! I’m a newbie quilter with about 5 finished quilts thanks to your binding tutorial. Jane has one of those smiles that just makes you grin right along with her! I would love to back a quilt with Minky and wondered if the process is the same? Batting or no batting? Same kind of quilt sandwich? Thanks for the help! Thank you Annette! I have a tutorial for how I quilt and baste with minky (I think it’s under my tutorials bar at the top). Basically it is the exact same, and I usually do use batting and just do extra basting. Sometimes I spray…and pin just to be safe! Thank you Melanie!! It is fun….and also hard to look back and not want to delete all my bad pictures and re-write all the cheesy things I said LOL! Hello and Happy Blog birthday! I enjoyed this post so much and the ones I went back and read too! Sew much fun, sew cute too! You are an amazing designer and I love your style! 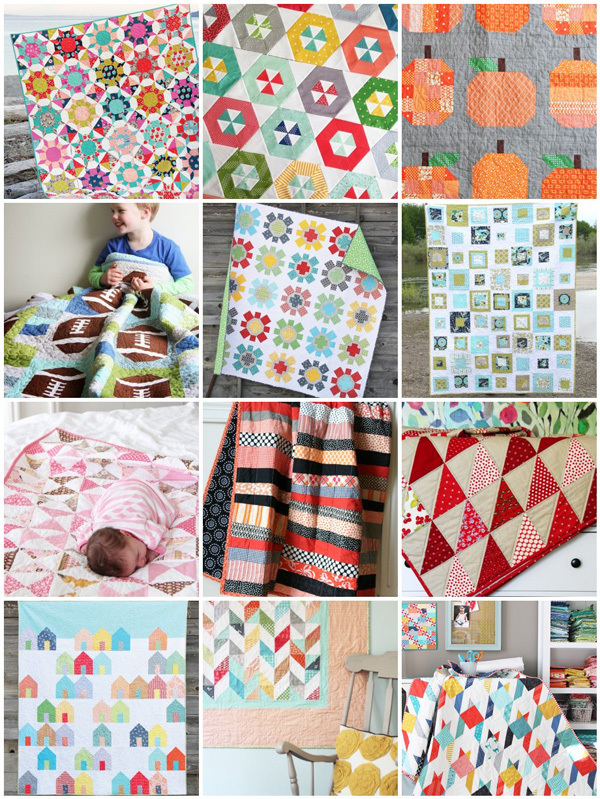 I just ordered the Mini Pumpkins Mini quilt pattern and I cannot wait to get it ! 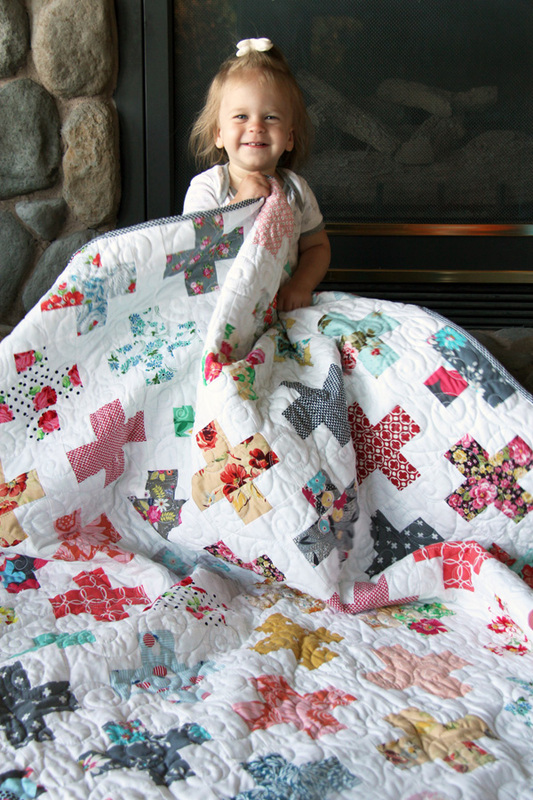 What a precious little girl in the photos and the quilt is nice too! Do you share who does your longarm quilting? Thank you Janan what a sweet comment! Kathy does most of my Long arm quilting, she has a button on my sidebar of my blog, your first quilt is 20% off and free shipping. I’ve also used Kaitlyn at knotandthreaddesigns.com (I think that’s it) and she’s great too! Allison I can not thank you enough for your wonderful tutorials, free patterns and your inspirational spirit to push me forward to learn and make quilts. I love your creativity. Your blog is delightful to look at with your beautiful quilts on display along with the cutest models. Happy 10 year blog anniversary! Thank you! What a sweet comment and compliment! Congrats on 10 years! That’s amazing! I have a quick question about the floral plus quilt. I’ve always wanted to back a quilt in minky, but didn’t know if you needed to prewash your fabrics first. I generally never prewash, so I’ve been nervous to mix cotton and minky due to cotton shrink rate. What did you do because it turned out beautifully! I don’t pre-wash either! The minky doesn’t shrink (I’ve been told that…and I’ve never noticed shrinkage), so I’ve never pre-washed either of the fabrics before using them. I have quilts that have been washed and used for years and they still look great with minky on the back! I have been following your blog for 9 years I think. The inspiration you are to me is irreplaceable! and I always grab first for one of your patterns! So glad you have been able to continue blogging. What a sweet comment Kelly! Thank you for visiting for 9 years!! !